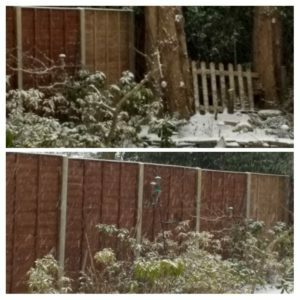 Seriously snow, what is the deal??? Yes, I know we have had snow in April before, but really I feel like we have had enough of snow now, and spring really needs to sort itself out. 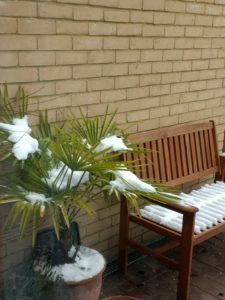 The snow started sticking to the bench and falling through the gaps and our poor palm tree had several inches collecting in the leaves. 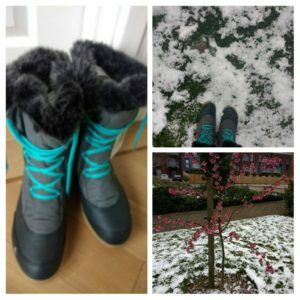 During the last bout of snow, I ordered some snow boots from Decathlon (I had ordered them in the first lot of snow and then cancelled it because they wouldn’t arrive in time, and then realised that I would probably use them a lot, even when marshalling at parkrun on cold days, so I re-ordered them). The snow delayed their delivery (of course) and I thought I’d be putting them away until next winter, but I’ve been wearing them this weekend! They are lovely and cosy, with good grips on the soles, but are not too heavy so comfy for walking into town or longer walks. At Panshanger on Saturday I was running along and a dog kept running in front of me and around me. The park is popular with dog walkers so you do get some off the lead as you run, but after a while I realised that a guy was running along the parkrun route, putting the dog on the lead when he went near a marshal and taking the dog off the lead as soon as he passed. This happened a few times and so as I was running alongside him I just asked “are you running the parkrun?” He told me he was, so I said “the dog needs to be on a short lead the whole time, not just when you pass a marshal”. He then said to me “well she’s a nightmare on the lead” so I just replied “it’s the rules for parkrun- if you don’t like it run somewhere else”. He sped up after that (and I got one of those horrible adrenaline rushes- I really hate confrontation so I am not sure why I did it really)- he did keep the dog on the lead after that and I only finished about 5 spots behind him. I did consider mentioning it to the RD, but in the end because he followed the rules after that I hoped that perhaps he would from now on. It just annoys me when people don’t follow the rules and there are always people who think the rules apply to everyone else but not them. Anyway, rant over. 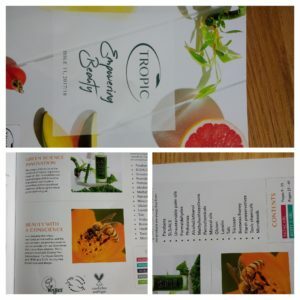 After parkrun on Saturday we went out on a walk together as then I was off to a “pamper” (not a party), for the company Tropics, who make natural skincare, free from things like parabens, SLS, palm oils, alcohol, microbeads, lanolin- all the products are vegan and not tested on animals. I was keen to find out about the suncream mainly, but we got to try cleanser, toner (which I don’t think I’d used since trying one as a teenager and finding that it stung so much), facial oil, moisturisers and face masks. It was good to sample the products and of course I ended up ordering more than the suncream, but I did manage to stick to products I will actually use. When I got home I wasn’t feeling very well, so Saturday evening was spent dozing in front of the fire and not doing much else. I was originally planning a run on Sunday but as I still didn’t feel 100% I decided to watch some TV and have a bit of a walk later instead. 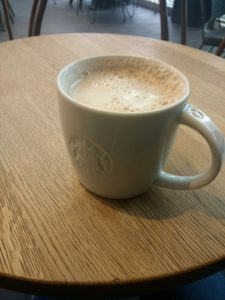 Once in town I decided to get my free drink from Starbucks and enjoyed just sitting and people watching for a bit, before walking home. I got back just in time as once home the snow started coming down really hard- my car had been clear earlier but then it was covered, as was our road. 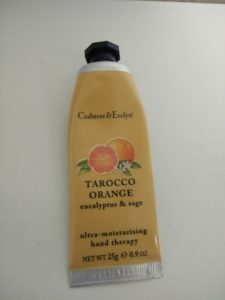 The dry air has been making my hands so cold- I had a little sample pack of these hand creams and have been putting them in all my pockets and bags so that one is always close by. On Sunday evening we went to see Game Night, which was very refreshing after the last few serious/gory films (Red Sparrow being particularly graphic and I am really surprised that it was a 15 and not an 18). At one point they referenced Cyberdyne Systems and I laughed (because of going on the Terminator ride in Florida many times)- literally no-one else in the cinema laughed! Anyway, it was fairly funny and a bit farcical, which I like (although the girl sitting next to me eating nachos really loudly was driving me crazy- I really do not like hearing people eat at the best of times). Do you have a good skincare routine? Do you think that is the end of the snow now??? I hope so- I’ve got a 10k race on Sunday and I really hope it goes ahead. Oh no- my fingers are crossed for you! I like the look of those boots. Good for winter warmness generally I expect. Well done challenging the man with the loose dog, I would have fumed silently :o). I had someone almost trip me up at parkrun a few weeks back because their dog ran in front of me at the last moment. There was no apology and he zoomed on before I could say anything. How did your 10k race go? I would usually be the silent type- still not sure what possessed me to talk to him! The boots are from Decathlon- pretty reasonable and hopefully will last a few winters.